Disney’s Animal Kingdom is a wonderful combination of theme park and safari; a place to view animals from across the globe and learn more about the places they’re originally from. Whether you fancy seeing the prowling tigers, or a real life dinosaur (well, almost!) then Animal Kingdom is the right place for you! The park is split into seven lands, which are all centred around the focal point of the park – the Tree of Life, on Discovery Island. The Tree of Life is a massive fourteen storeys tall, and is the icon of the park. Discovery Island is also the place to find a number of restaurants, gift shops and help points at the park – as well as to see kangaroos and lemurs, or to watch the 4D It’s a Bugs Life show! Camp Minnie-Mickey is the next land – based on an American summer camp. 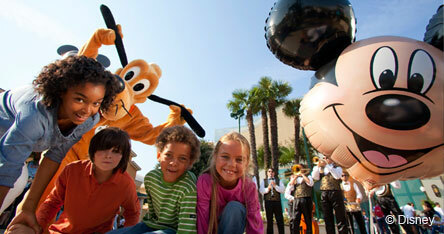 Here, guests can meet their favourite Disney characters and enjoy some interactive attractions. There’s also a live stage show based on The Lion King. The next land is Africa – set in a fictional African village named Harambe, here you will find a number of African animals to observe in their natural habitats. One of the most exciting rides of the park can be found here; the Kilimanjaro Safaris. Guests join a safari convoy to see animals roaming across the savannah with lions, elephants and hippos all to be spotted. The nearby Pangani Forest Exploration Trail takes guests on a search of the Silverback gorillas. Asia is another land within Animal Kingdom – here, guests can see a live bird show with appearances from birds such as the Black Crowned Crane and American Bald Eagle, amongst others! There’s also a watery adventure – the Kali River Rapids – which takes riders down a waterfall – and a rollercoaster through the Himalayas, called Expedition Everest. Next, guests can visit Rafiki’s Planet Watch – a place to see how Disney supports a number of conversation projects round the world. Guests can ask vets questions in the animal care facilities, or pet some of the domesticated animals in the Affection Section – a dedicated petting zoo. One of the most memorable sections of the park is DinoLand U.S.A; a place where guests old and young can be wowed by the lives of dinosaurs. The area is based around the (fictitious) Dino Institute, where guests can find out about the extinct creatures, and see what remains of them today. There’s a dinosaur themed play park for children, and a thrilling ride through the Late Cretaceous Period to meet a real life DINOSAUR. There are also flying dinosaur rides for families, such as TriceraTop Spin and a spinning coaster called Primeval Whirl.